Eventually I would have a meagre bowl of sullen, verging-on-burnt popcorn, scores of blackened and unpopped kernels lurking at the bottom. It was shameful, I tell you. But I was certain that it wasn’t my fault. Not enough people in England bought popcorn, I thought — so the popcorn you bought in the supermarket was always stale. That’s why it wouldn’t pop! Right? Right? I can’t tell you how many people I told this story to. They all believed me. I am terribly convincing when I want to be. And then — Lionel Shriver changed my life. It’s not the popcorn, folks, it’s the pan. Just stay with me a minute here, and all will be revealed. Lionel knows her popcorn. Go round for dinner at her house — either in Britain or Brooklyn, and I’ve done both — and a bowl of popcorn will always be served with the pre-dinner drinks. You have to really careful, in my experience, not to scarf too much of it, because that meal that follows is always incredibly tasty (I’m going to go after the recipe for the crabcakes we had a couple of weeks ago). Watching Lionel pop in Prospect Park, I remarked — rather wistfully — how admiring I was of the explosiveness of her popcorn: “loft”, Lionel calls it: that’s when the popcorn lifts the lid right off the pan. “Revere Ware,” she said, indicating the light, stainless-steel pan on the stove. “The secret to great popcorn is a cheap pan.” Revere Ware is stuff we grew up with in America — not a fancy pot at all, just your everyday boiler. Revere Ware is miles from Le Creuset or Calphalon: drop a Revere Ware pot on your foot and you won’t have to go to the hospital, let’s put it that way. “If you’re pan’s too heavy it will get too hot, and then your popcorn burns without popping.” As she spoke, the lid began to rise off the pan, clouds of lofty popcorn making a break for freedom. Reader, the scales fell from my eyes. My proud collection of fine saucepans was doing me no good at all. My first purchase, once back home in England, was a £5 pan bought on the Bethnal Green Road; above is a batch of lofty popcorn made therein. How lucky am I to be Lionel’s popcorn pal? Truly lucky — for she sealed our kernel kinship with a gift of JollyTime Buttery Seasoning. Don’t laugh. It’s da bomb. Pop! Pop pop! POP! to put on top: if you have no JollyTime, melt a tablespoon of butter if you want — plain old salt & pepper will do fine, or a sprinkling of mixed seasoning like Old Bay. Lionel throws a lot of chili powder over hers, which makes for an extra-exciting snack. Pour the oil into your cheap pan and put in two or three kernels of popcorn. Set over medium heat with the lid on: when the kernels pop, it’s time to add the rest of the corn. Dump it in, cover, and give things a good shake to coat with the oil. Soon your explosions will start! When they slow to a pop… pop… pop… it’s time to turn off the heat, pour into a bowl, and season. 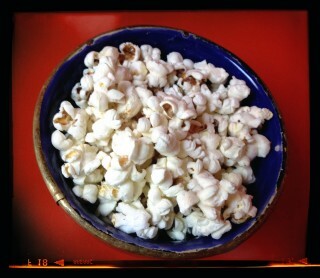 1/2 cup of kernels serves two, I’d say.